Our kidneys are still in shock. How did JooJoo, a full-service kushiyaki eatery, get away with being tangential and offensive at the same time? 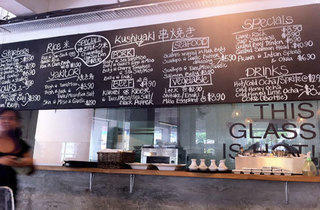 The space of this Japanese grilled skewered-foods restaurant looks pleasant enough. 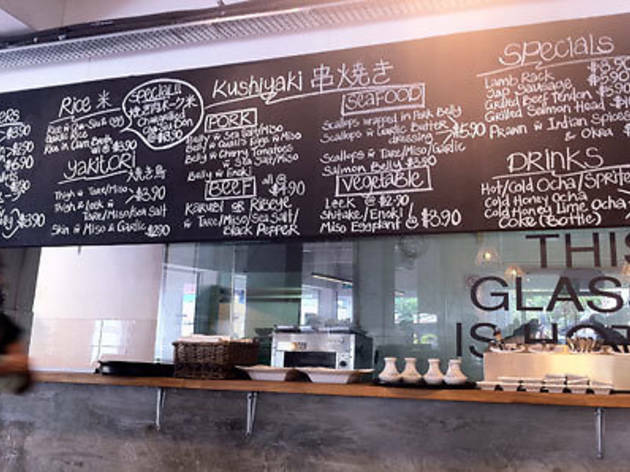 It’s set up in a simple, white-walled ground-floor shophouse unit that’s been divided into three sections – sister establishments Awfully Chocolate and Mooshi Bakes serve as the restaurant’s neighbours. Diners at JooJoo can place orders with any of the siblings through the servers. Unfortunately, not all siblings are made equal: during our visit, the pastry kitchen held its own. The hot kitchen, however, was haemorrhaging salt. Any positive feedback that may have come from the nine-course kushiyaki set for two ($36.90++) will be undermined by the sodium overload. The chicken thigh and shiitake mushrooms might have got away with being pleasant had its salty sauces been thinned a little. The miso soups and garlic rice were downright brackish, with the salt overwhelming all three dishes. The normally pronounced bulb drowned in the rice, and segregated grains were cooked to become more mushy than sticky. Clearly this is one kitchen that does not believe in tasting its food – in the unlikely event that they do, the taster’s buds have evidently been shot. In disbelief, we put in an order for a bowl of the rice with cha-siu and egg ($3.90). The thin cross-section of pork belly was promising: it had deep, soft layers of gelatinous fat and tender meat. Its level of saltiness would have been acceptable had it not been served with the even saltier hardboiled, soft-centred half-egg and the aforementioned garlic rice. Fortunately, not everything was as distressing to swallow: the one redeeming factor of this harsh meal was the pear frangipane slice ($7.90) – a warm, light almond cake overlaid with pear slices. The caramelisation of the natural sugars of the pears and the crumb layer of the cake added crunchy textures, and the generous scoop of creamy vanilla ice cream on the side brought about good contrast.